"The Resistance will not be intimidated." With a single shot from Starkiller Base, the First Order destroyed the Republic capital of Hosnian Prime, along with four other planets in the Hosnian system. Countless lives were lost as the First Order declared war on the Republic and the freedoms it represented. In the face of such a terrible show of power, it would have been easy to give into despair. To accept defeat. To surrender. But the Resistance didn't surrender. They stood up and fought back. Leia Organa, Poe Dameron, and the other members of the Resistance's leadership organized a desperate assault. They scrambled fighters to fly against Starkiller Base even before its shields had been disabled. They risked everything in the name of freedom. The shields and Starkiller Base were destroyed. The Resistance won the day. The Resistance was not intimidated. It will not be intimidated, and when the First Order retaliates, the Resistance will stand up once again. It will meet the First Order's TIEs in space and it will bomb the First Order's capital ships and its weapons emplacements on the ground. 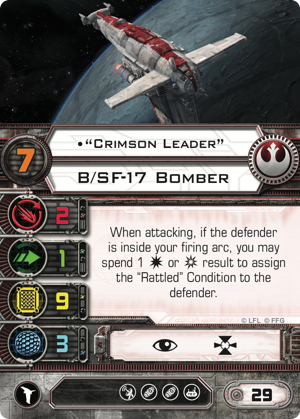 Here, the B/SF-17 heavy bomber has a big part to play in the Resistance's plans, and the Resistance Bomber Expansion Pack lets you realize those plans in your games of X-Wing™. Just like the Star Wars galaxy, X-Wing is always moving forward. As the game's developers stated upon the release of Wave XI, they're always looking for ways to add something new—to present new options for you to explore and to enrich the overall gaming experience. 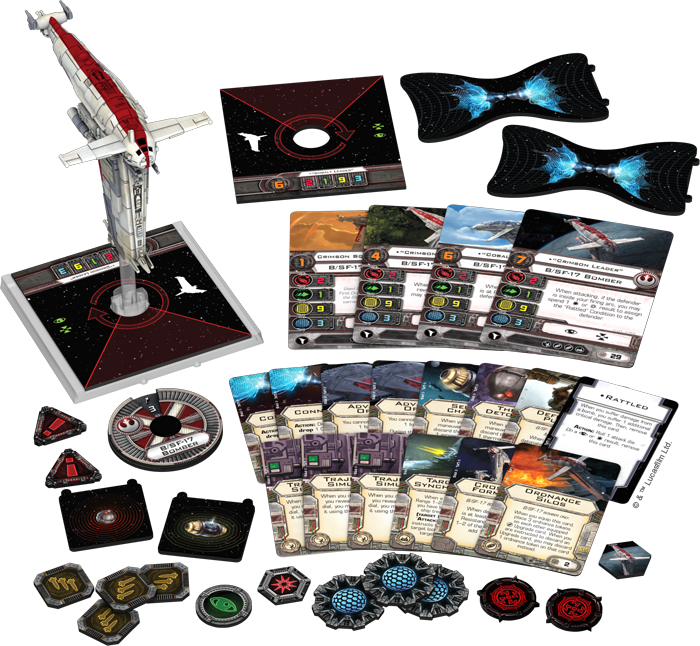 With the Resistance Bomber Expansion Pack, the Resistance faction—and the Rebel primary faction—gain access to the B/SF-17 heavy bomber, a large-base ship with a hefty mix of shields and hull, a primary weapon turret, and the means to load up on bombs… a lot of bombs. 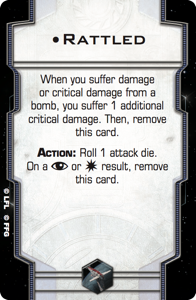 At this point, however, bombs aren't new to X-Wing. 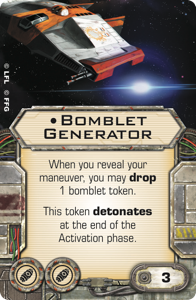 In fact, with the K-wing, Sabine Wren , the Scurrg, and the Bomblet Generator , it's safe to say that the game's bombers have established themselves as one of the game's pillars—rounding out the existing dynamic between the game's efficient jousters, its arc dodgers, and its turret platforms. 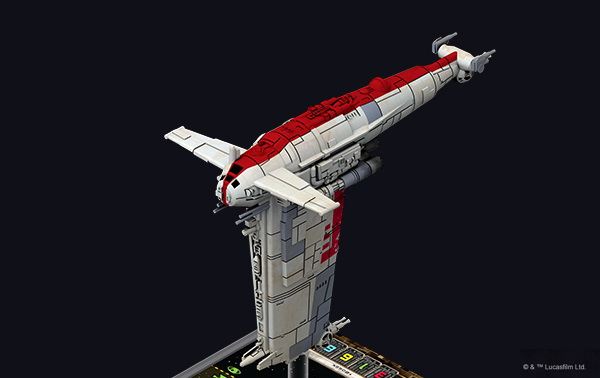 All the same, the B/SF-17 bomber brings something radically new to bombers and to the game, itself. It brings a trajectory. The Trajectory Simulator system upgrade allows the Resistance bomber to launch bombs from its front guides, rather than dropping them from the rear. 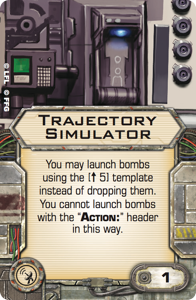 Anytime the Resistance bomber—or another ship equipped with the Trajectory Simulator—would drop a bomb as it reveals its maneuver dial, it can instead choose to launch the bomb, placing the straight Speed 5 template in its front guides and then placing the bomb token at the other end. You'll have to be sure you don't then fly into your bomb's explosion, but you'll have the option to turn away from your bombs, or even reverse your thrust and come to a complete stop. 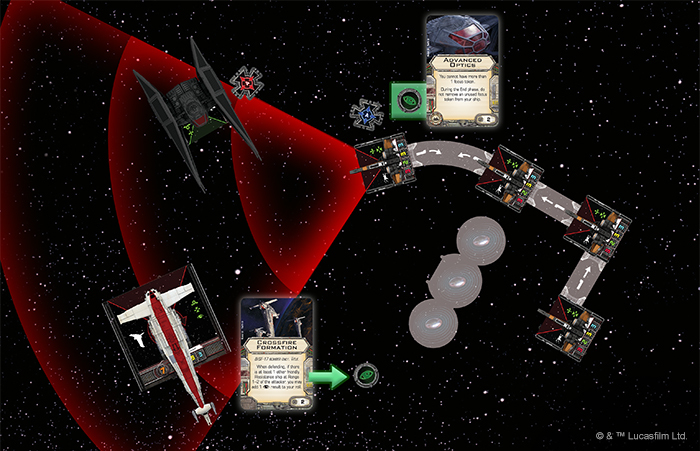 The Resistance bomber doesn't have the game's most flexible maneuver dial, but because the Trajectory Simulator says you "may" launch bombs, rather than decreeing that you "must" launch them, means you can deploy your bombs wherever you want them most—in front of your ship or behind it. 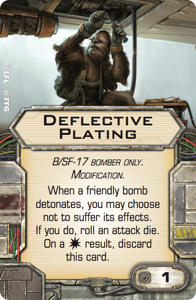 Even so, there may be times to fly into your bomb's blast radius—to block your opponent's flight paths or avoid your opponent's firing arcs. Or, you might really want to drop a bomb even though your opponent has blocked your bomber's flight path. 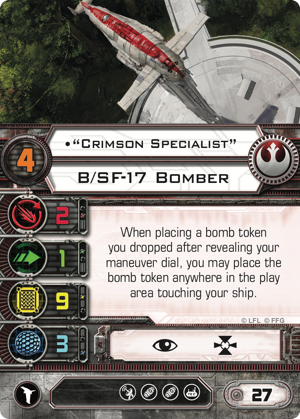 At these times, you'll find the heavy bomber's Deflective Plating makes these options far more palatable and the modification is likely to prove particularly valuable to your "Crimson Specialist," whose ability to place bombs anywhere next to his base makes those bombs harder to avoid—not only for your opponents but also for "Crimson Specialist." With the introduction of Trajectory Simulator, your bomber squadrons will soon be able to present a viable forward-facing threat, but you'll need to learn how best to plan your approach in order to catch your foes with your bombs. Part of this education will come as you plot your opening maneuvers, gauging the distance between your squadron and your enemy's ships so that you can time your bombs' launch. Part of it may come as you decide when and where to break formation, or how to use your formation flying to your advantage, launching or dropping bombs to create overlapping blast radiuses. No matter how you master your bombing runs, however, you're going to need a back-up plan for when the enemy's ships race through your explosions. Perhaps they'll be limping forward with their shields offline and their hulls battered. Perhaps you'll have completely destroyed the initial wave, only to discover that the aces who held the rear are completely unscathed. Either way, your bomber's primary weapon and agility of 1 will start to look a little weak when the big fighter's lasers start coming fast and furious. Here, the Crossfire Formation Title upgrade can make a big difference. 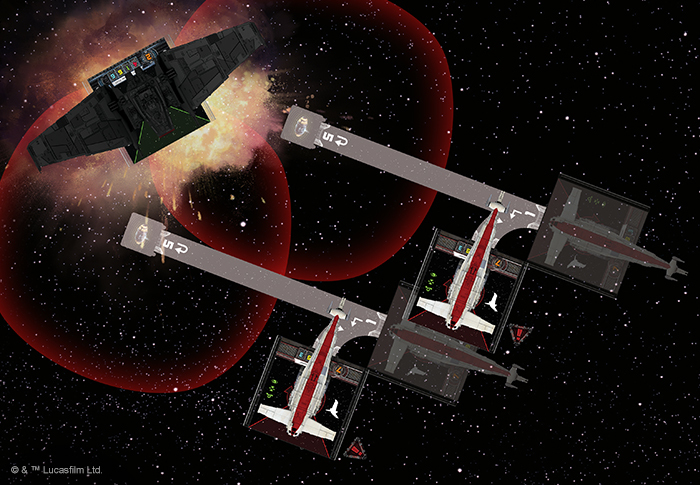 Your bombers shouldn't have to fight alone, and so long as they're fighting alongside one or more Resistance ships—at least one of which is at Range 1 to 2 of the attacker—your bombers can gain a free focus result whenever they're defending. Of course, there are a couple of notable points to Crossfire Formation's prerequisites. 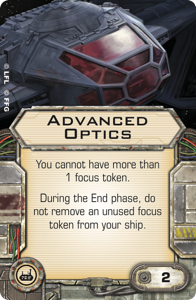 First, you have to perform the focus action to benefit from this Title, but that's already the game's most common and flexible action—not much of a sacrifice, except on the rounds that you might prefer to drop an Action: bomb. The more noteworthy restriction, however, is the requirement that the heavy bomber should have a Resistance ally at Range 1 to 2 of the attacker. 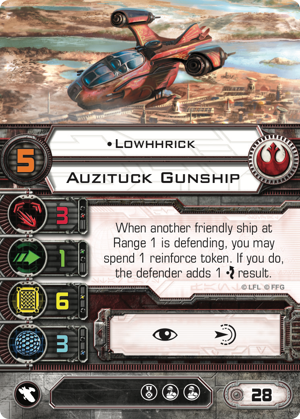 This is the most remarkable distinction between the Rebel Alliance and Resistance factions yet introduced to the game. 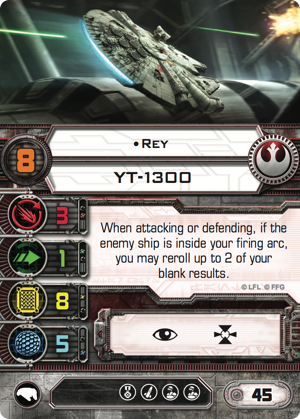 As noted in the rulebook from The Force Awakens™ Core Set (pdf, 6.6 MB), both factions are part of the larger Rebel primary faction, and are more or less interchangeable for the purposes of squad-building. 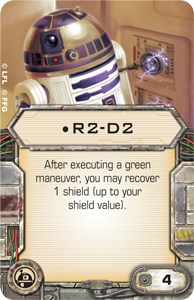 R2-D2 , for example, can fly just as easily with Poe Dameron as he can with Luke Skywalker . 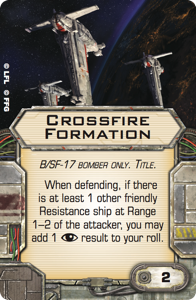 Now, however, the Resistance bomber's fantastic ability to deal damage and the defensive rewards of the Crossfire Formation Title you may be encouraged to explore more squad designs themed around the Resistance. 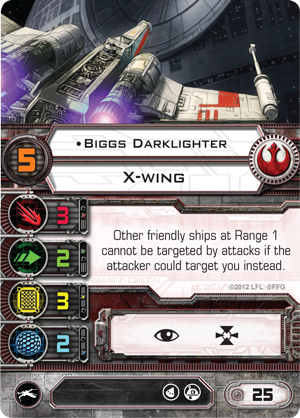 When Poe Dameron grants your bombers extra defense by zipping about the battlefield with BB-8 and Push the Limit , you might rethink the idea of depending upon the assistance of a Rebel Alliance pilot like Biggs Darklighter or Lowhhrick . 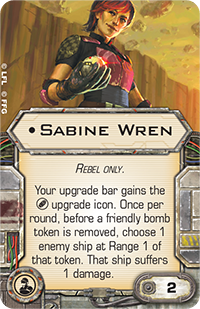 And since we're looking at a greater potential for era-specific squad designs, the Resistance Bomber Expansion Pack advances the possibility further by introducing a healthy supply of tech upgrades. 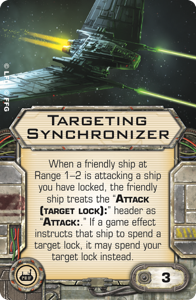 At this point, the tech upgrade slot is limited to ships from the age of the First Order and Resistance, so the expansion's copy of Targeting Synchronizer and its two copies of Advanced Optics are extra fodder for your Resistance ships. 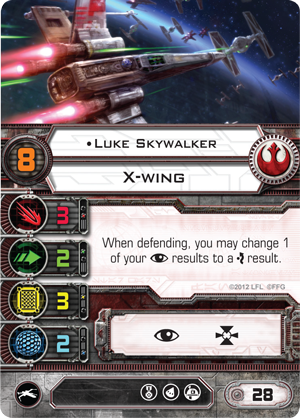 It's pretty good stuff, though, as the idea of equipping Poe Dameron with Advanced Optics is rather hard to ignore. 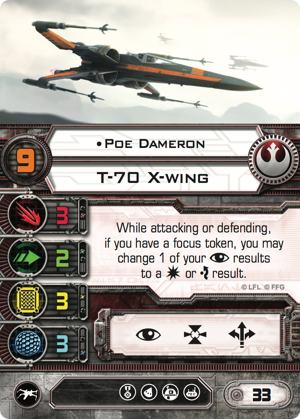 Because he has already stored a focus token on Advanced Optics, Poe Dameron can use his actions with BB-8 and Push the Limit to barrel roll and boost around a set of Cluster Mines before executing his maneuver and acquiring a target lock—while simultaneously granting his bomber allies the benefits of their Crossfire Formation Titles. Keep Your Confidence. Rattle Theirs. 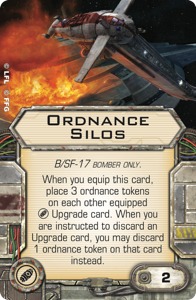 With all the bombs the Resistance bomber can unleash from its Ordnance Silos , it's not hard to understand why the members of the Resistance can hold their heads up even in the darkest times. They know they stand a good chance of winning any fight. 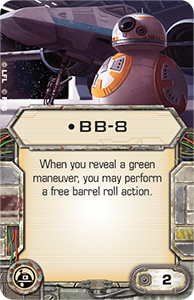 So long as they aren't taken completely by surprise—so long as they can get their fighters and bombers into position—they know they can rely upon the talents of heroes like Rey and Poe Dameron, as well as those of bomber pilots like "Crimson Leader." When the Resistance Bomber Expansion Pack arrives, it's not the Resistance's pilots who should be Rattled . It's the First Order's fighter pilots who'll have to worry about all the dangers they'll face on the field of battle. 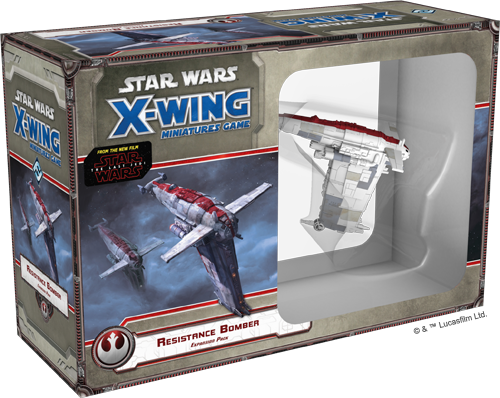 Is the Resistance Bomber Expansion Pack (SWX67) the dawn of a new age for the Resistance? 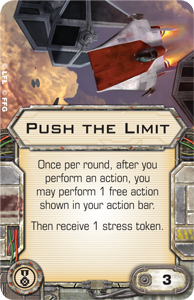 Will you be willing to break your Resistance forces away from their predecessors in the Rebel Alliance? Share your thoughts with the members of our community forums. Then head to your local retailer to pre-order your copy today, or click here to pre-order it from our webstore!